Since the Holy Spirit fell on everyone in the Upper Room on Pentecost — and there were women present — why can’t women be priests? Can we say of the 70 sent two by two that they were all men? First of all, if you would like to read about these events, the Spirit falling on everyone in the Upper Room is in Acts 2:1-4. The 70 disciples sent by Jesus is found in Lk 10:1. Now, regarding the Upper Room, tradition has it that at least one woman, Mary, was there. There were probably other women there too, if we assume that the 120 who were gathered for prayer (cf. Acts 1:14-15) were also present when the Holy Spirit came down. But, it’s not clear. I also don't know if the 70 sent out by Jesus were all men. If Jesus meant to pattern this after the 70 men that Moses chose to help him lead the people (cf. Num 11:24-25), then we could infer that the 70 were all men. But, Luke only refers to them as “disciples”, and we know that Jesus had female followers. Here too, it is difficult to say. What I can tell you is that the ministerial priesthood did not begin with the outpouring of the Holy Spirit, nor did it begin when the disciples were sent two-by-two. It began at the Last Supper, when Jesus told the 12 apostles -- all men -- to "Do this in memory of me." This is considered to be the moment when the ministerial priesthood was instituted because this is when Jesus commanded that the Sacrifice of the Mass be offered, and the offering of a sacrifice is a priestly act. Since the apostles were men, and their successors are men (cf. 2 Tim 2:2), this is why only men can receive the Sacrament of Holy Orders. Of course, there are other reasons too. Another reason why the priest must be a man is because the primary function of the priest is to act in the person of Christ in the Sacrifice of the Mass. In the Mass, the Bridegroom comes to meet His Bride. The Son gives Himself to the Father. The King invites His subjects to the wedding feast. This symbolism is destroyed when the priest is not a man, for a woman cannot be a groom, son, or king. We must also keep in mind that Jesus did not choose 12 men simply because He lived in a patriarchal society. 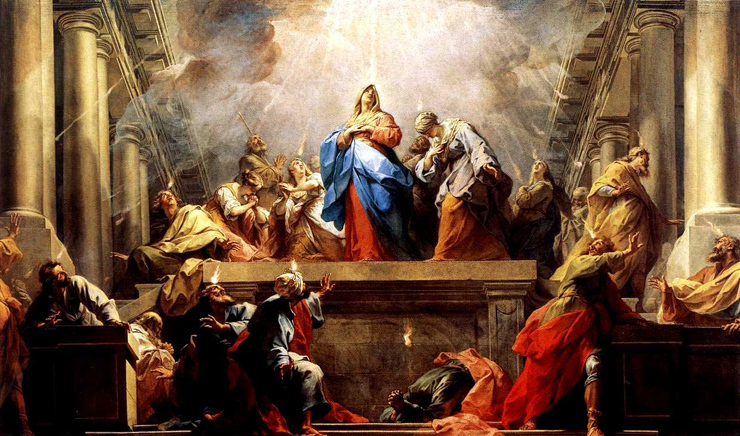 Instead, He chose 12 men because He discerned it to be the will of the Father, after much prayer and deliberation (cf. Lk 6:12-13). Jesus was not a puppet of His culture, and the Church is not either. The Church can only do what Jesus did, and Jesus only did what the Father sent Him to do. Jesus chose men, so the Church does too. Does the Bible Say Anything about Having Priests in the Church? Where Are Deacons Found in Scripture? "Salutations in the Marketplaces" and Calling Priests "Father"